Freshly picked herbs can make all the difference when it comes to cooking meals at home. Herbs can add a delicious flavour to a host of different dishes, including stews, salads, and roast dinners. You can buy pots and tins of dried herbs in the supermarket each time you go, but growing your own is a much more cost effective method of adding delicious, fresh flavour to your food. Many people get put off growing their own food, as they think it takes a lot of time and space to start a vegetable garden. The great thing about a herb garden though is that you can use small pots and containers that won’t take up too much room and can be positioned on your patio or just by your back door. Don’t go for completely random herbs just because you see them first; make sure you choose herbs that you will use as part of your cooking. Basil is a favourite with many, you can use it in soup, pasta, or salads, and it’s easy to grow on a windowsill. Other easy to grow herbs that are often used in cooking include parsley, chives, and thyme. If you’re unsure which herbs to go for, have a look on the Internet to see what you could incorporate into the dishes you regularly cook at home. The great thing about herbs is that they don’t need to be planted in the ground - as long as you have a good container, set up in the right way, your herbs will still grow just as well. If you want to make your herb garden a bit different, then find things around the house that you can pot your herbs in – this be an old wine crate, a metal bucket, a small watering can, or a lined basket. It’s important that your herbs can drain, so place some stones or broken china in the bottom of your container and pop the compost on top. Make sure you use fresh compost, so that your herbs get all the nutrients they will need. Dig a hole twice the side of your seedlings in the compost, then pop your herbs in and fill in the gaps. 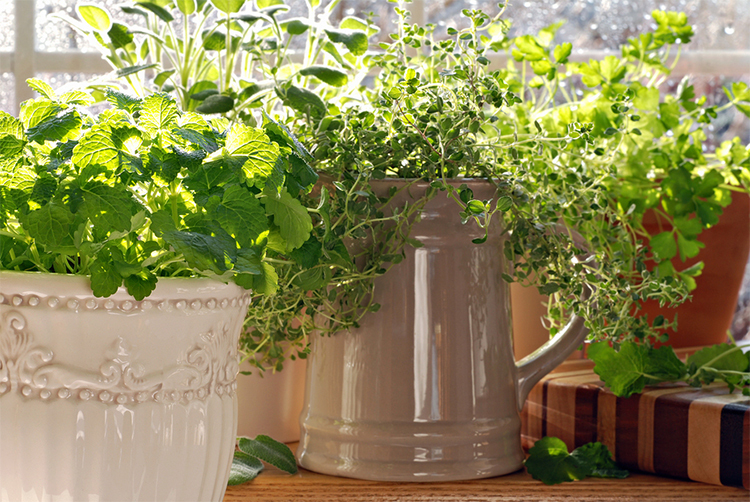 Herbs need a good amount of sunlight and a small amount of water once or twice a week. Whenever you grow your own herbs you will need to regularly harvest the leaves in order to encourage fresh growth. Some plants like chives and borage have edible flowers that taste just as good as the leaves. Pinch off the growing tips on young herb plants to help them grow to be full and bushy, instead of tall and spindly. With herbs like chives and mint you can be fairly rough, so don’t worry about cutting them back too far, as they will quickly come back. Hunters have over 150 offices nationwide including Yorkshire, London, Hammersmith and the South East.